It was 4 o’clock in the afternoon, and I found myself hanging around the House-side entrance to the Capitol building, hoping to interview lawmakers during the protracted government shutdown in October. The members had been called by the Republican leadership to open just one portion of the government without authorizing funds for the Affordable Care Act, a partial solution that had rallied Democrats in opposition. As dusk settled in, I lingered to interview the representatives as they walked in and out of what everyone considered at this point to be a scene of political theater. Behind me, I heard the distinctive croak of Zach Wamp, a former congressman who was busy talking up his new job to current members of Congress. He boasted that he is now working for Palantir, the controversial intelligence contractor. “I’m kind of overseeing their operations up here,” Wamp said when I asked what he does for Palantir. He ended the conversation abruptly when questioned about the scandals associated with the firm, which include allegations of spying on activists and other privacy violations. On paper, the lobbying industry is quickly disappearing. In January, records indicated that for the third straight year, overall spending on lobbying decreased. Lobbyists themselves continue to deregister in droves. In 2013, the number of registered lobbyists dipped to 12,281, the lowest number on file since 2002. But experts say that lobbying isn’t dying; instead, it’s simply going underground. 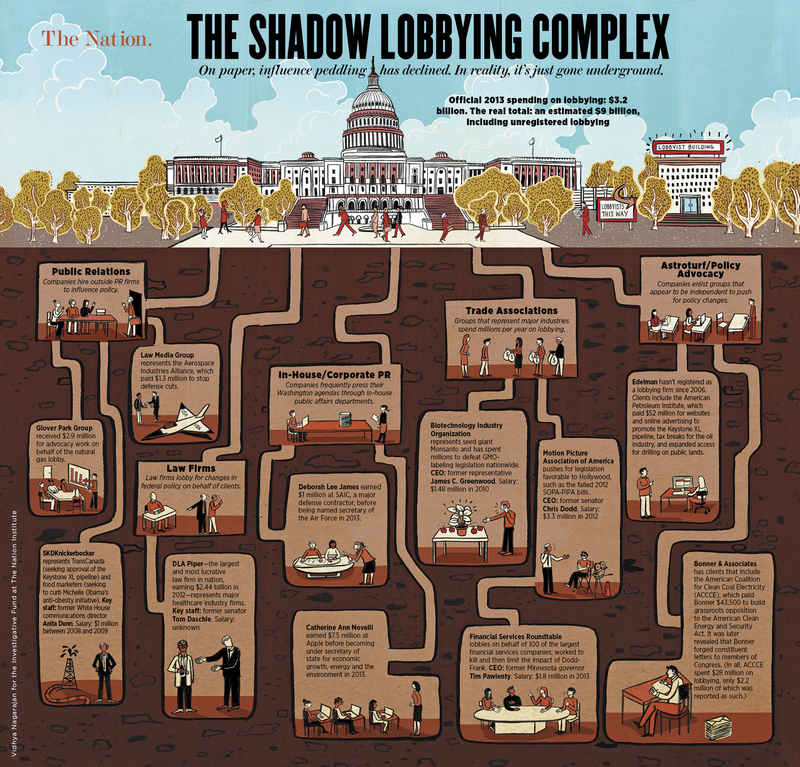 The problem, says American University professor James Thurber, who has studied congressional lobbying for more than thirty years, is that “most of what is going on in Washington is not covered” by the lobbyist-registration system. Thurber, who is currently advising the American Bar Association’s lobbying-reform task force, adds that his research suggests the true number of working lobbyists is closer to 100,000. A loophole-ridden law, poor enforcement, the development of increasingly sophisticated strategies that enlist third-party validators and create faux-grassroots campaigns, along with an Obama administration executive order that gave many in the profession a disincentive to register—all of these forces have combined to produce a near-total collapse of the system that was designed to keep tabs on federal lobbying. While the official figure puts the annual spending on lobbying at $3.2 billion in 2013, Thurber estimates that the industry brings in more than $9 billion a year. Other experts have made similar estimates, but no one is sure how large the industry has become. Lee Drutman, a lobbying expert at the Sunlight Foundation, says that at least twice as much is spent on lobbying as is officially reported. Trade association documents, bankruptcy filings and reports from political consulting firms reviewed by The Nation show that many of America’s largest corporations have spent much more on lobbying than they’ve officially disclosed. In some cases, the quarterly registration system, used by the public and journalists, shows only one-tenth of the amount that firms spend to win favorable treatment by the federal government. Fairfax—high-end carmakers Tesla and Aston Martin have opened new showrooms to keep up with demand. The new captains of the influence-peddling industry lobby openly and with no interest in registration, reaping enormous rewards. Tim Pawlenty, in his first two months as head of a lobbying association for financial companies that include Barclays and Wells Fargo, made more than double his annual $120,000 salary as governor of Minnesota. The self-described “Sam’s Club Republican” earns over $1.8 million a year working largely on banking regulations. He is not a registered lobbyist. Chris Dodd, the former senator and Democratic presidential candidate who pledged not to become a lobbyist once he retired from Congress in 2010, made $3.3 million in his second year as chief of the movie industry lobby. (Dodd’s salary increased as he led the Motion Picture Association of America through a failed effort to pass an intellectual-property bill called the Stop Online Piracy Act, better known as SOPA.) Technically, however, Dodd hasn’t broken his pledge: though he seeks to win policy victories for his Hollywood-based members, he is not registered as a lobbyist. Rather than using the L-word to describe what they do, many lobbyists prefer the more banal rubric of “government relations” or “government affairs.” Reflecting this trend, the American League of Lobbyists—a professional association for the industry—changed its name in November to the Association of Government Relations Professionals. And while registered lobbyists must report payments from clients, those ducking the system quietly bring in the biggest paydays. Apple’s former vice president of “worldwide government affairs,” Catherine Novelli, earned over $7.5 million last year while helping the company deal with congressional inquiries about its alleged tax-dodging strategies—without registering as a lobbyist. Deborah Lee James, until recently the vice president for government affairs at SAIC, a major defense contractor, earned nearly $1 million in 2013 despite also being unregistered. Luxury magazines such as The Washingtonian and Washington Life are filled with the latest displays of affluence by the district’s nonlobbying lobbyists. BP’s head of public affairs—another euphemism for influence peddling popular among unregistered lobbyists—recently spent $1.7 million for a six-bedroom house in the tony neighborhood of Spring Valley. Earlier this year, an executive from the Albright Stonebridge Group, a government-relations firm that influences policy on behalf of corporate interests without being registered under the LDA, shelled out $4.2 million for a home in Georgetown. Commercial real estate tells a similar story. A report by the real estate firm Cassidy Turley forecast “strong gains” for downtown office leases to the corporate lobbying and government-relations industries. In the weeks before fast-food workers earning less than $8 an hour began a wave of walkout strikes across the country in December, the National Restaurant Association, a lobbying group for eateries like McDonald’s and Burger King dedicated to blocking efforts to raise the minimum wage, moved into a swanky new office space on L Street to accommodate its 20 percent growth in staff operations. But even though the National Restaurant Association’s staff and spending have grown, the organization reported its lowest lobbying figures since 2007 on its latest forms. Notably, despite what the registration forms say, Wall Street doesn’t seem to think that the lobbying business is drying up. The profits from the influence industry have aroused the interest of deep-pocketed investors. As a result, the boutique firms and partnerships that made up America’s lobbying industry for the last two centuries are giving way to multibillion-dollar conglomerates. The London-based WPP Group has been on a buying spree and now owns prominent lobbying and political-communication businesses like the Glover Park Group, Burson-Marsteller, Hill & Knowlton, the Dewey Square Group, Public Strategies Inc., the Prime Policy Group, and Quinn Gillespie & Associates. The company’s global earnings surged to $15.6 billion in 2012, thanks in part to the expansion of “lobbying and funding of lobbying” in America, according to a speech by WPP chief executive Martin Sorrell. Qorvis Communications, an international lobbying firm based in Washington, was recently purchased by the Paris-based Publicis Groupe, which is in talks to merge with the Omnicom Group, another conglomerate that owns many government-affairs firms. Fleishman-Hillard, one of the dozens of Beltway public relations firms that work to influence policy without registering under the LDA, is an Omnicom Group company. And why not keep buying? A November report from McKinsey & Company estimated that the “business value at stake from government and regulatory intervention” is about 30 percent of earnings for companies in most sectors. Simply put, government policies can mean the difference of billions of dollars for major companies, and spending on politics offers a superb payoff. A study from the University of Kansas found that companies lobbying for a tax holiday received a 22,000 percent return on the money they spent to influence the legislation. Step into the House clerk’s room in the basement of the Longworth House Office Building, and you’ll find an area with a television tuned to CNN, one or two staffers idling by their computers, and another feeding documents into a printer-scanner. On the other side of Capitol Hill is the office of the secretary of the Senate, a similarly small room filled with mostly idle staffers. When Congress created the current lobbyist-registration system, they “handed over the responsibility for administering the law to these two offices,” says Timothy LaPira, an assistant professor at James Madison University who has written several papers on the failings of the current law. Enforcement authority ultimately lies with the United States Attorney’s Office for Washington, DC. In an interview, Keith Morgan, the deputy chief of that office, acknowledged that the Justice Department has largely pursued cases in which a registered lobbyist has failed to update a quarterly statement or fallen delinquent, and the House clerk or Senate secretary has spotted the error. Though there have been investigations, Morgan’s office has never prosecuted anyone for failing to register or for deregistering while continuing to lobby. “We have no ability to know if somebody doesn’t register unless some insider or a competitor comes and says, ‘We have reason to believe that this individual or this group is lobbying,’” Morgan says. To the best of his knowledge, even though Congress added criminal penalties for failing to disclose lobbying activities, there has not been one single case of criminal charges being filed under the law. Morgan’s office has limited capacity for pursuing violations of the LDA. There are four attorneys at the Justice Department charged with overseeing compliance with federal lobbying law, but their workload also includes healthcare and housing fraud, false claims and other kinds of cases. The only full-time employee for lobbying law is a paralegal who helps with the data entry on disclosures. “Quite frankly, there may be some instances where people who are lobbying should register,” Morgan says, adding that there have been “shifts in the lobbying industry to try to evade” registration. LaPira confirms the situation: “The Department of Justice does not have the time, or resources, or political will, to really pursue any of these cases.” As a result, the American people are increasingly left in the dark about who’s calling the shots in their government. Finding a suitable way to enforce lobbying law has been a problem for decades, going back to the first registration system. While lobbying under false pretenses—using a front group or paying a professional to peddle influence on your behalf—was routinely banned by state law for much of the nineteenth century, this started to change in 1890, when Massachusetts (followed by other states) professionalized the role of lobbyists by instituting registration systems and other guidelines. Regulation on the federal level didn’t arrive until after a wave of congressional inquiries in the early twentieth century. The first lobbyist-registration system was drafted by Senator Hugo Black of Alabama, a pugnacious New Deal Democrat who later became a Supreme Court justice. Black’s probes as head of the Special Committee to Investigate Lobbying Activities, which existed from 1935 through 1938, revealed a wide array of shady practices, from paying off newspaper editors for positive publicity to the creation of fake citizens’ organizations to generate phony grassroots petitions to Congress. Driscoll attempted to track down some of the constituents responsible for the telegrams, to no avail; they didn’t seem to exist. Then Black took charge of the matter and began issuing blanket subpoenas to lobbyists, utility executives and even Western Union, the company that delivered the telegrams. The results were astounding. The utility companies had paid for over 250,000 telegrams to lawmakers, using names often taken at random from the local directories. The American Liberty League and other pressure groups like the Farmers’ Independence Council—all self-styled grassroots organizations that had come into existence in those years to oppose New Deal reforms—were found to be largely financed by a small group of wealthy families, including the du Ponts (who provided a third of the money) and members of the Morgan, Mellon and Rockefeller clans. In 1935, in the weeks before Roosevelt signed the trustbusting bill to break up the electric utility monopoly, Black—who had written a provision in it requiring utility-industry lobbyists to register and disclose their activities—called for a more comprehensive system for the entire federal government. “Contrary to tradition, against the public morals and hostile to good government, the lobby has reached such a position of power that it threatens government itself,” he warned. Black’s legislation easily passed the Senate, but a reconciled version of the bill failed the following year in the House, where it was shot down by a three-to-one margin. Both houses were decisively under Democratic control, but lobbyists held more sway in the lower chamber, and Democrats there were far more reluctant to pursue aggressive investigations against industry titans. As a result, even though a registration system for foreign lobbyists was created in 1938 after several scandals involving Nazi Germany’s use of agents to spread propaganda in the United States, it wasn’t until 1946 that a wide-ranging lobbyist-registration act, based on Black’s proposed legislation a decade earlier, was finally enacted. However, the law—which applied only to those seeking to influence Congress and not the executive branch—provided such a vague definition of lobbying that it was challenged in the Supreme Court in 1954. The Court voted to narrow the law so that it would apply only to those seeking direct communication with lawmakers. The Court also interpreted the law narrowly, so that only those organizations hired “principally” to influence legislation would have to register. And the lack of a clear enforcement mechanism—a problem that persists to this day—meant that few bothered to comply even with these narrowed requirements. Although the Watergate scandal sparked renewed interest in disclosure by lobbyists, it was not until the mid-’90s that Congress updated the system. The impetus for reform came from a 1991 study by the General Accounting Office that revealed how porous the 1946 act had become. The study found that 10,000 lobbyists listed in an industry guidebook had failed to register. Of those who had, as many as 94 percent failed to complete their registration forms as required by law. These days, the system is regulated largely through the Lobbying Disclosure Act of 1995, which was signed by President Bill Clinton and revised substantially in 2007 to add new rules concerning lobbyist gifts in the wake of the Jack Abramoff scandal. Obama’s only significant act to curb the influence of lobbyists is now seen as a failure. In fact, in many ways, he only made the problem worse. In his first month in office, Obama signed an executive order stating that registered lobbyists would not be welcome in his administration. The administration quickly backpedaled, however, issuing a number of exemptions in the following years. But the larger effect was that many lobbyists simply deregistered, removing themselves from the lobbying-disclosure system and thereby pushing the influence-peddling profession more into the shadows. As Robert Gibbs, then Obama’s press secretary, explained glibly to Time magazine, when asked about reports of an Obama nominee engaging in lobbying activity: “If you’re not registered to lobby, you can’t be a lobbyist.” The clear implication was that the executive order would be narrowly enforced—and only against those who were registered under the LDA. After being defeated for re-election in 2004, Daschle, like many retiring lawmakers, joined a law firm heavily invested in lobbying and became a “policy adviser” for a number of corporate clients. His salary at the firm rose to more than $2 million in the waning years of the Bush administration, in addition to the $2 million he made in 2008 advising a private equity firm. While questions over Daschle’s taxes scuttled his 2008 nomination as secretary of health and human services, he continued to play a key role behind the scenes, visiting the White House, participating in Obama administration meetings, and working with legislators on healthcare policy. Now with the firm DLA Piper, Daschle refuses to register for his lobbying activities, though he counts major healthcare firms among his clients. Daschle, like other unregistered lobbyists, could muster a legal defense for his failure to register. Because the LDA was designed to ensure that ordinary citizens petitioning their government would not be forced to register as lobbyists, the law has a three-pronged test to determine who should—a test that inadvertently allows Washington’s biggest influence peddlers to ignore the disclosure law. According to this test, a lobbyist is an individual who (1) earns at least $2,500 from lobbying over a three-month period; (2) has more than one lobbying contact for his services; and (3) spends at least 20 percent of his time during a three-month period making “lobbying contacts.” If a lobbyist can argue that just one of these statements doesn’t apply, he is not required to register. Lobbyists, moreover, are considered lobbyists only if they advocate on behalf of a certain position on legislation; if they’re simply gathering intelligence, they are not considered lobbyists under the law. Many unregistered lobbyists have argued that since they spend less than 20 percent, or one full day per week, engaged in contacting lawmakers, they should not have to register. Others have found equally creative justifications for not complying with the law. Newt Gingrich, during the last presidential campaign, memorably declared that he did not have to register as a lobbyist for the Federal Home Loan Mortgage Corporation, which paid him about $1.7 million, because he worked for Freddie Mac as a “historian.” Gingrich also developed a healthcare institute that offered draft legislation, meetings with lawmakers and other benefits to its member corporations, including Astra-Zeneca and WellPoint. This institute, which even brought on Daschle for some events, did not register any of its advocacy as lobbying. Gingrich’s “historian” claim was widely mocked. And ethics watchdogs, including Public Citizen’s Craig Holman, regard Daschle’s failure to disclose as a clear “flouting” of the law. But their behavior has become the norm. Last summer, in the wake of the disastrous collapse of the Rana Plaza factory in Bangladesh, which killed more than 1,100 people, a team from Daschle’s law firm, DLA Piper—including retired Senator George Mitchell and Charlie Scheeler, a former Senate aide—unveiled a plan to allow American retailers to skirt responsibility for future garment-factory disasters. While international advocates and some retailers with business in Bangladesh put forward a plan to create legally binding requirements for safety reforms, the Mitchell plan allows firms to pay only small upfront fees for upgrades, with no future commitments. Scheeler met with legislative aides in the Cannon House Office Building to generate support for the alternative agreement, which labor activists panned because it would not hold retail companies accountable for factory fires and other hazards. Like Daschle, Scheeler and Mitchell are not registered lobbyists, so the officials they engaged as well as the wider public were not necessarily aware that their firm represents Gap, one of the largest retailers identified with the Rana Plaza collapse, and one of the firms that would have been affected by the more stringent safety agreement. As common as the practice is, such clear-cut examples of unregistered influence peddling are actually hard to come by given that the work is done, by and large, behind closed doors. One way that such information does come to light is through bankruptcy proceedings—as occurred when one company was forced to reveal all of its creditors in May 2012. LightSquared, a startup that hoped to compete with AT&T and Verizon in the cellphone business, retained a staggering seventeen different lobbying firms as it pressed the Federal Communications Commission for an exemption that would allow it to use GPS signals to run a nationwide broadband cellphone service. After failing to obtain a favorable ruling from the FCC, LightSquared began lobbying the Defense Department for a “spectrum swap” to use airwaves allocated to the military. As all avenues began to close, the company declared bankruptcy. Though LightSquared had disclosed a large number of registered lobbyists—including seven former members of Congress—the company’s bankruptcy proceedings revealed an even greater influence game. One of LightSquared’s creditors was the Chertoff Group, a consulting firm run by former Homeland Security Secretary Michael Chertoff. LightSquared also owed money to Portico Policy Advisors, a company founded by Jim Doyle, a former Clinton administration aide who now advises businesses on a “range of policy, regulatory and communications issues,” according to his website. Doyle is the co-founder of Business Forward, a trade association that routinely organizes meetings with White House officials and business leaders. Neither the Chertoff Group nor Portico Policy Advisors is registered as a lobbying firm. LightSquared’s influence team extended even to Stanley McChrystal, the former commander in charge of military operations in Afghanistan. After McChrystal retired following a Rolling Stone story that exposed his dim view of senior administration officials, he founded the McChrystal Group, an Alexandria, Virginia–based consulting firm. In January 2012, as LightSquared desperately sought to acquire spectrum, representatives from McChrystal’s firm contacted the Defense Department’s mid-Atlantic area frequency coordinator to discuss the deal. The McChrystal Group was interested in the spectrum reserved for test aircraft and weapons systems, according to an account published by GPS World, a trade publication. The McChrystal Group, which is not registered as a lobbying firm, initially denied ever contacting the Defense Department on the spectrum deal. “We purposefully have not been doing those types of things, and lobbying is among those practices better left to other people and has never been part of our business plan or focus,” said Duncan Boothby, a senior aide to McChrystal. Boothby said the firm’s work on behalf of LightSquared related only to an “initial assessment,” in which the McChrystal Group would “come in and present to them what services we could provide, where we saw their strategic problems.” LightSquared bankruptcy documents show $70,000 in payments to the McChrystal Group. Days after our initial interview, Boothby called to say that the McChrystal Group had indeed contacted the Defense Department on behalf of LightSquared, yet stressed that it had merely sought to collect information rather than advocate a certain position—a key difference that would excuse the company from having to register as a lobbying firm. One of the biggest problems with lobbyist registration is that the LDA was never intended to cover so-called “outside lobbying.” Like previous iterations of the law, the current system does nothing to regulate the fake grassroots groups that enraged Senator Black, or the surrogate think tanks and public relations gimmicks used to corral popular support for special-interest legislative campaigns. Many lobbying businesses offer a full range of capabilities that fall well outside the LDA’s definition of lobbying. Take, for example, the pressure brought by banks against a provision of the Dodd-Frank law that capped the amount they could charge retailers for credit card transactions. A group of banks affected by the "swipe fee" reform financed an organization called the Electronic Payments Coalition to persuade Congress to roll back the cap. In 2011, the year the group came close to achieving its goal in the Senate, the Electronic Payments Coalition officially reported spending exactly $1 million on federal lobbying. In reality, the bank-financed group spent about $17 million to influence lawmakers that year, according to tax forms filed with the IRS months after its legislative effort failed. The unreported $16 million in advocacy expenses covered policy advisers, a public relations company in DC and at least one telemarketing firm. One lobbyist helping to lead the campaign, a former Democratic congressional staffer named Jeffrey Tassey, was paid $882,406, though the Electronic Payments Coalition disclosed only $400,000 in the registration forms filed with officials. The banks aren’t alone. Virtually every significant corporate interest group spends millions of dollars every year on policy advocacy that isn’t disclosed as lobbying. Raytheon, Northrop Grumman, Honeywell, Lockheed Martin, GE Aviation and other large defense contractors, for example, pooled their money through a trade group, the Aerospace Industries Association (AIA), to hire a number of outside consultants to push back against so-called sequestration cuts in the defense budget. Since 2011, the defense contractors have paid a political consulting firm called the Law Media Group to help undo military budget cuts. “I invite you to make your voice heard as part of this industry effort through your own contacts with your member of Congress, your senators and President Obama,” wrote Wesley Bush, chief executive of Northrop Grumman, in a letter calling on subcontractors to visit a website called Second to None, a project of the AIA that the Law Media Group was promoting. The Law Media Group never registered as a lobbying firm, though the defense firms paid it at least $1,277,466 for the influence campaign. “While we’re no longer working with AIA, we did press/communications work on the initial rollout of AIA’s ‘Second to None’ campaign, but not any kind of lobbying or Hill outreach,” the Law Media Group’s Tony Park said in an e-mail explaining why his firm never disclosed its activities under the lobbyist-registration system. Other examples abound. News Corporation, CBS, Gannett Broadcasting and other media companies, through a trade group, disclosed only $100,000 in lobbying payments to a firm called Mercury Public Affairs in 2012. In fact, according to documents obtained by The Nation, the amount paid by the broadcasters to Mercury, which contacted lawmakers on spectrum and tax issues, was closer to $510,000. Similarly, a group of fracking companies that year retained the lobbying firm Glover Park Group for $2.9 million. But the contract with Glover Park was never disclosed. Mercury Public Affairs and the Glover Park Group did not respond to requests for comment. Edelman, a public relations firm that helps businesses develop grassroots support for their legislative and regulatory policies in Washington, has also racked up lucrative contracts. According to documents obtained by The Nation, the firm was retained by the grocery industry ($741,625), the oil refinery industry ($638,494), a group of mining companies ($1,371,044), the electric utility industry ($683,183), the National Association of Manufacturers ($1,080,87), and the American Petroleum Institute ($51,917,692). On behalf of the API, an oil and gas industry lobby, Edelman managed multiple websites and online advertising efforts urging officials to approve the Keystone XL pipeline, support tax deductions for the oil industry, and expand access for drilling on public lands. Despite this seemingly obvious lobbying activity, Edelman has not been registered as a lobbying firm since 2006. The so-called “grassroots advocacy” that the firm specializes in falls outside the statutory definition in the Lobbying Disclosure Act. Even those who claim to engage only in public relations do participate, in some cases, in direct meetings. One such example is Anita Dunn, the former White House communications director and current informal adviser to the Obama administration. After leaving the administration in 2009, she joined SKDKnickerbocker, a “political consulting” firm, taking on corporate accounts to influence Obama initiatives. SKDKnickerbocker worked to curb Michelle Obama’s obesity initiative on behalf of a group of food marketing companies; to weaken Education Department regulations on behalf of a for-profit college; and the firm is currently working on behalf of TransCanada to get the Keystone XL pipeline approved. “I work with some corporations, because the fact of the matter is, we’re in a democracy, and there’s a dialogue, and people have a right to be heard,” Dunn says in defense of these efforts. SKDKnickerbocker has never registered as a lobbying firm. The New York Times reported that despite its claims to engage only in public relations, SKDKnickerbocker has contacted Obama administration officials on behalf of its clients. The Obama administration’s greatest defeat, many argue, was the president’s failure to pass a comprehensive law addressing climate change during his first two years in office, when the Democrats had control of both houses of Congress. Coal and coal-powered utility companies, fearing a loss in profits resulting from the bill, financed a group called the American Coalition for Clean Coal Electricity (ACCCE, pronounced “Ace”) to influence the debate. After a critical vote in the House of Representatives in 2009, in which the climate bill just barely passed, a Democratic lawmaker from Virginia discovered that many of the letters he had received from supposed constituents asking him to oppose the bill had been forged. The letters appeared to come from local chapters of the American Association of University Women, the NAACP and other organizations—but in fact they were written by Bonner & Associates, a political consulting firm and subcontractor for ACCCE. At least two other Democratic lawmakers, Kathy Dahlkemper and Chris Carney, both from Pennsylvania, received forged letters as well. ACCCE did disclose $2.2 million in lobbying spending as the House took up President Obama’s climate bill in 2009. Tax forms filed with the IRS, however, show that the group in fact spent $28,353,630 in advocacy that year. The work with Bonner & Associates never had to be disclosed as lobbying. Unlike Hugo Black with his multiyear investigation in the 1930s, which triggered the first federal lobbying reforms, Democratic legislators in recent years have done little to confront the problem. Black issued subpoenas and had his staff travel the country to interview those involved and to explore the depths of the industry’s deception. But in 2009, House Democrats held a single hearing and then largely dismissed the issue, with little consequence to those involved. One ACCCE representative claimed under oath that his group did not oppose the climate bill—a claim easily refutable through a simple Google search. The corporate executives who financed the group were not compelled to testify, and there were no legal penalties for those involved in the fake letter campaign. With industry organizations and their affiliates spreading confusion about the bill and even the science underpinning anthropogenic climate change, the legislation later collapsed and died in the Senate, dooming prospects for reform.